Another amazingly productive event in the books! In the last few hours of the fourth annual WeDigBio global transcription event we'd like to start off with a huge THANK YOU to all of the citizen science participants, event hosts, institutional supporters, online transcription platforms, social media contributors, programmers and technical support people, organizers, and everyone else who helped make this event a success! We can't do this without you and we are so appreciative of our onsite and online communities. It'll take us a little while to crunch the final numbers, but it's clear that collectively over 20,000 digitization tasks were completed. Wow! That's an incredible amount of data that is now well on its way to being discoverable and accessible to researchers, educators, policy makers, and the public. Every transcription counts and collectively WeDigBio gets things done! 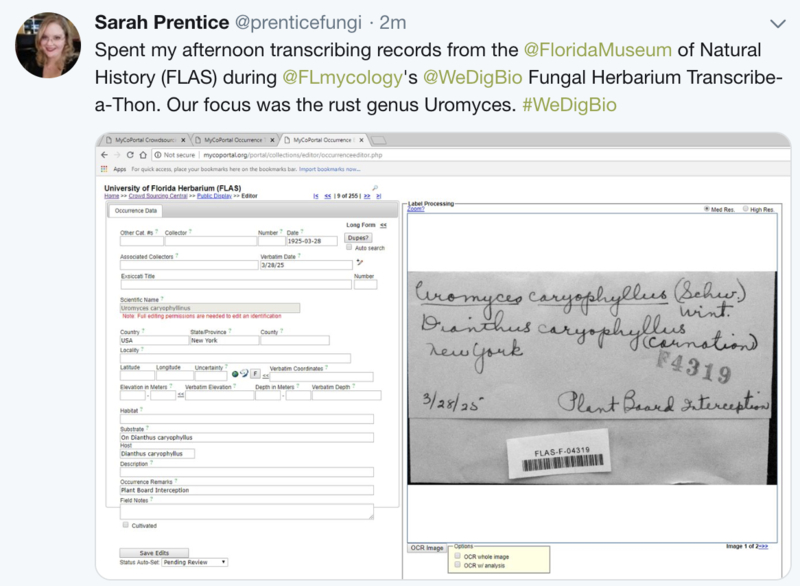 In what might be one of the most creatively named organizations, the Florida Museum of Natural History hosted the FALAFEL (Florida Academic Lichen and Fungi Enthusiasts League) Mycology group and their Fungal Herbarium Transcript-a-thon. The Field Museum hosted another group of eager citizen scientists and gave out some great swag. 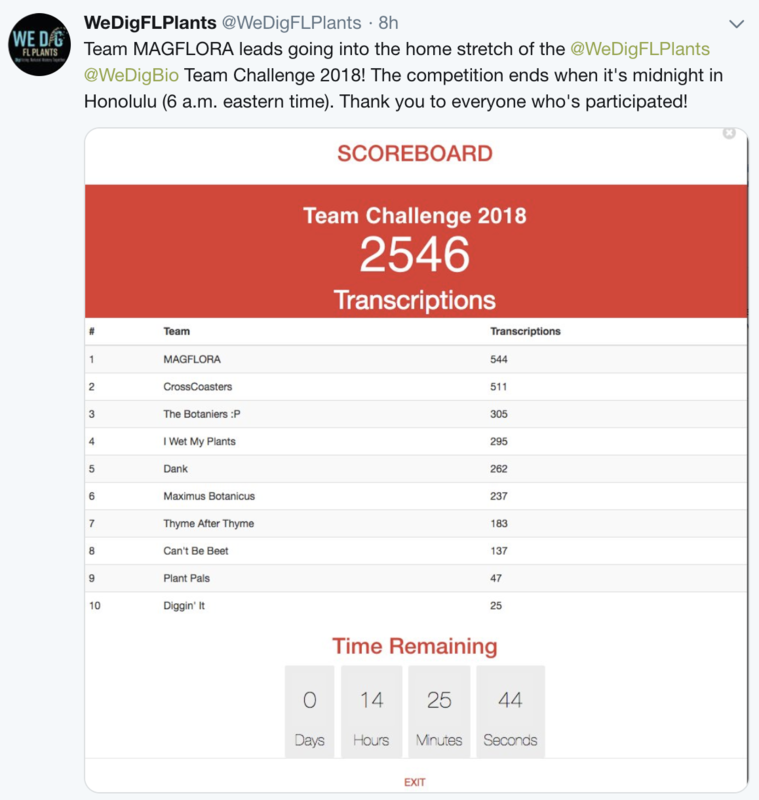 The Team Challenge hosted by WeDigFLPlants currently has MAGFLORA in the lead. At the time of this post, there are still a few hours for team CrossCoasters to make a run for first place! Notes from Nature posed a challenge to see if they could get to a WeDigBio total of 16,000 transcriptions and it looks to me like they reached it! Nice rally everyone! 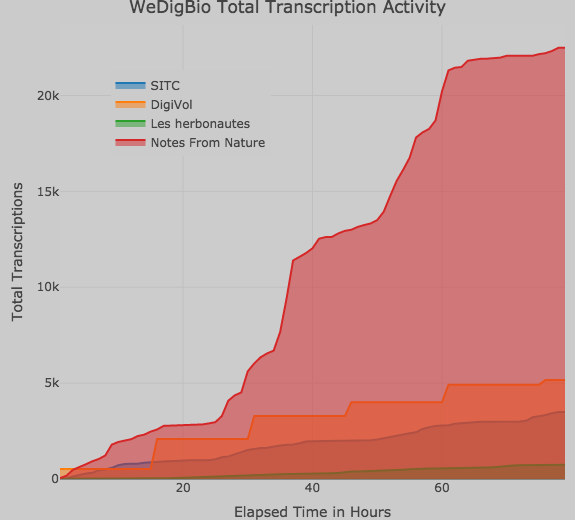 Don't forget, even though WeDigBio is winding down, the amazing platforms are available year-round for all your transcription needs. Keep working on your favorite project or find a new one from our Online Project List. 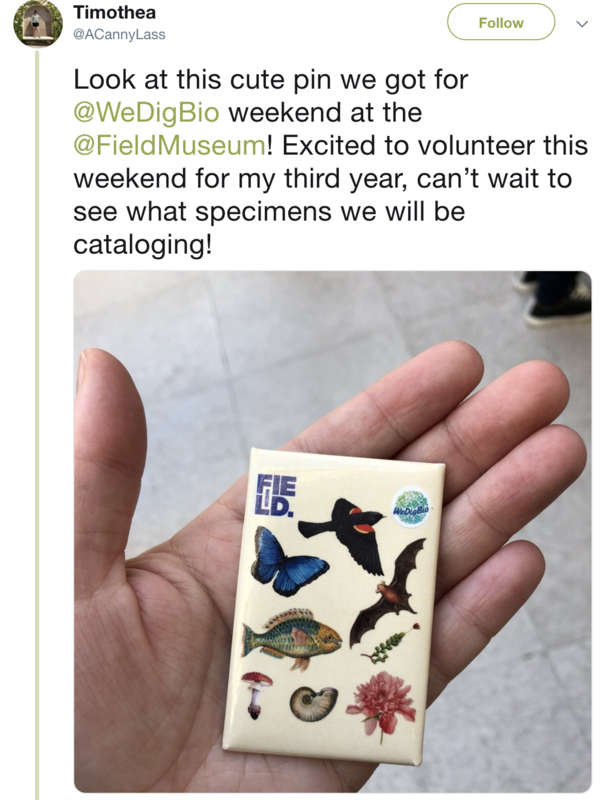 Continue to follow us on Twitter, @WeDigBio, and with #WeDigBio. We'll keep posting news and updates, and we look forward to hearing about all of your digitization successes.